This entry was posted in shotgun and tagged 12ga, AllOutdoor, semi-auto. Bookmark the permalink. You mention that a ventilated rib would make a difference in the sight picture, inferring that the 28″ barrel does not have one. Yet the pictures seem to indicate the opposite is true, that it does indeed have a ventilated rib. Can you clear that up for me? I was trying to say that it does have a rib. Let me check the text for clarity. This lady is my favorite of the many who model for you. Oh, yes, the shotgun is nice, too. More of the pretty lady. More shotguns. 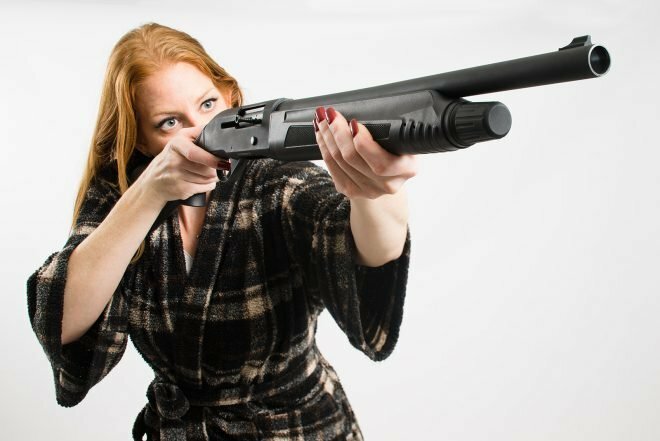 More of the pretty lady with shotguns, well, anything. And, thank you for taking the time to blog, it’s time consuming and not always rewarding, so I want to thank you for sharing your outstanding work.